The drama-thriller Argo directed by and starring Ben Affleck (The Company Men) is based on a declassified true story about a fascinating covert operation to rescue a half-dozen Americans hiding out in the middle of Tehran during the Iran hostage crisis of 1979. It’s a tremendously entertaining and engrossing Hollywood film, certainly one of the best of 2012. 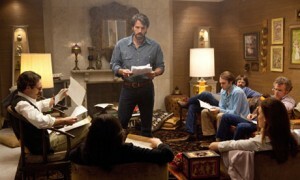 Ben Affleck oversees an escape plan for hostages in Iran in Argo. Production values across the board are excellent, all of which support Argo’s primary strengths, which begin with Affleck’s precise, measured direction, which is always perfectly modulated to the mood of the material its presenting, be it drama, exposition, suspense or action. Affleck’s roster of players, which includes Kyle Chndler (Super 8), Bryan Cranston (TV’s Breaking Bad), and Chris Messina (Greenberg) as the government suits and Alan Arkin (The Change-Up) and John Goodman (Trouble with the Curve) as the Hollywooders behind the movie-within-the-movie, give effective, down-played readings with nary a grandstanding or scene-stealing scene among them. And just as he keeps his cast on the straight and narrow for the narrative, Affleck the leading man offers what might be his most unadorned performance as a government man with deadly serious job to perform. It’s clear that Affleck the filmmaker and his team know how amazing their story is, and they expertly serve its potential with intelligence, steadiness and realism. Even the scenes that we’ve seen in government movies a zillion times—men sitting around conference room tables making decisions, agents dealing with their superiors in the hierarchy—feel fresh and real. The audio and video presentations are both excellent. Argo’s image isn’t overly colorful—it doesn’t “pop”—but has a rather controlled, almost muted look that one associates with the Seventies. This is particularly effective in the outdoor sequences set in the Middle East, as well as the in the interior of the bustling Tehran Airport. The audio quality of the dialogue is crisp but subtle, making the more pronounced audio sequences—the raid of the embassy, a venture into the outdoor bazaar and, again, the airport—all the more effective. The Blu-ray’s smart collection of supplements provides the perfect complement to the feature. Affleck and screenwriter Chris Terrio’s commentary covers the production concisely if a bit dryly, with real insight into the physical production as well as analyses of how choices were made while adapting the real-life story for the movies. Affleck talks up all the other bonuses during his commentary (in addition to praising the discs’ producers), beginning with the “Picture in Picture: Eyewitness Account” function, which features the actual people involved in the event offering their take on what really happened as it all unspools on screen. Joining them on the PIP are the real Mendez and other government figures, as well as former President Jimmy Carter, who’s also on hand for a featurette that looks at the CIA/Hollywood connection. It would probably enough to have a couple of Blu-ray supplements featuring a former president, but there’s even more, including a production piece on how the 1970s was authenticated on screen and a 2005 TV doc celebrating the 25th anniversary of the “Canadian Caper. Sure, there’s a little repetition, but overall, the Argo supplements genuinely add to Argo the film, and that’s the point. Argo and Affleck have already won a slew of Golden Globes, as well as awards from the DGA, SAG, Producers Guild and other organizations, and both the film and its maker/star are sure to pick up some more at the Academy Awards. Though Affleck isn’t in the running for a director’s Oscar (undoubtedly the year’s most high-publicized snub), there’s a strong chance he’ll be standing behind the podium accepting a producer’s award for Best Picture. Thank you for another informative web site. The place else may just I get that kind of info written in such an ideal manner? I’ve a mission that I am just now operating on, and I’ve been at the glance out for such info.